I went to see the Tintin movie at the Liberty Cinema in the company of my young nephew and his lovely fiancée. I wanted to see it on the big screen but was rather reluctant to go on my own, so the young couple took pity on the old Uncle and off we went. Mind you, I did pay for the tickets! It was nice to visit the old Liberty after a lapse of 35 years. I have known Tintin circa 1955 whereas Steven Spielberg first discovered Tintin only in 1981! Shame on you Steven! This of course makes me a Tintinologist and even a Professor of Tintinology. The film was good but, having been brought up on the books, I couldn’t help feeling that the books were better. I must have been five or six years old when “The Crab with the Golden Claws” was first serialised in a Sri Lankan daily newspaper. Each day, two strips ending in a cliffhanger would appear in the “Cartoon” page and we could not wait until the next day to find out the outcome. It took a while for the books to appear in Sri Lanka and so we were dependent on the daily newspaper strip. We were all hooked on Tintin, even staid old Dad. Dad could predict what would happen next with a fair degree of accuracy and which he did with the air of a sage. Uncle Melvin, just to annoy Dad, would come up with an alternate and totally weird twist, much to our amusement. I tried to comb my hair in Tintin style but without much success. At school we tried to play Tintin but it was not much of a success as we all wanted to be Tintin. A couple of bumbling classmates, who happened to be twins, were forced into the roles of Thompson & Thomson. They had no choice. Many years later when I started traveling to exotic destinations I visited Peru, primarily because of “The Prisoners of the Sun”. On my first visit there I learnt, from the tour operator, that most men of my age group visit Peru because of their Tintin upbringing. The local little Peruvian boys in Cuzco, Puno and La Raya all looked like Zorrino, the little local boy who guides Tintin and the Captain to the Temple of the Sun. Then there was the rather fiery local Pisco of course, if you want to get drunk like the Captain did and whose example I followed. In pursuit of “The Cigars of the Pharaoh” I have visited Egypt. I found “The Blue Lotus” in China, “The Broken Ear” in Paraguay and “Tintin and The Picaros” in the whole of South America. On a visit to Geneva I found the Hotel Bristol where Tintin and Captain Haddock go to meet General Alcazar (“Red Sea Sharks”), the Hotel Cornavin (“The Calculus Affair”) and of course Lake Geneva, where their car skidded off the road and they ended up in the drink. Then there were the souks of Morocco (“The Crab with the Golden Claws”) where I nearly bought a burnouse….you know the hooded robe- like thing that Thompson and Thomson wear in this story. At one time I worked in Scotland and discovered the settings for “The Black Island” (Try the Outer Hebrides, if you are interested). It is a pity that I haven’t been able to visit all the places that Tintin went to. I haven’t been to the Moon, for instance, but at least I know the locations. Not many people know that the Farasan Islands are real islands in the Red Sea and belong to Saudi Arabia (see “The Red Sea Sharks”). I did get to Siberia but Herge was rather vague as to the exact locations in “Tintin in the Land of The Soviets”. Then of course I have been to Tibet. By the time I visited Tibet I had changed quite a lot, for the worse. I was no longer the fresh-faced Tintin, and with my unkempt beard and my drinking habits, I was more of a Captain Haddock. At a very high altitude, sleeping in tents and in the freezing cold, I repacked my day-pack for an early morning hike to Everest Base Camp. As I packed my bag I realized that my essential items were the same as that of Captain Haddock’s: Bottles of spirits and packs of tobacco! I did make it to Base Camp with a little bit of difficulty (Thank you for asking!) but that night I opted out of sleeping in a tent and slept in the relative comfort of the Rongbuk Monastery. All this has got me thinking of a new adventure for Tintin especially since I have now come back home: Tintin in Sri Lanka! Well why not? There are a lot of Tintin parodies and pastiches on the web. So I decided to do a script outline. Readers can improve on this and write back to the Sunday Times. How about it? Okay, here we go! They of course arrive in Sri Lanka by ship. An old tub like the “Ramona” or the “Karaboudjan” would do. 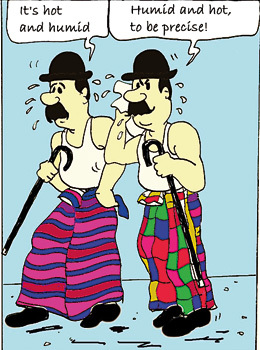 Meanwhile, Thompson and Thomson, who like to dress up like the locals to blend in, are in sarong and banian but with their trademark bowler hats on. “The climate is humid and hot,” says Thompson. “To be precise, hot and humid!” says Thomson. They are walking along the harbour road with a large crowd of local touts following them: “You want hotel sir? You want taxi sir? You want tour sir? You want buy gems sir? Buy tea?”etc. Thomp & Thom enter the GOH and bump into Tintin and the Captain. Tintin and Captain rush out to catch a train from Colombo Fort to Mt. Lavinia. Thompson &Thom rush out as well but fall into open drain. Train shows no sign of leaving in a hurry. They rush out of train. Locomotive air horn blows violently and unexpectedly. The Captain trips up on a suitcase and falls off the platform. “Blistering barnacles etc”. Tintin hails a three wheeler. Driver asks for $200. Tintin commandeers the three-wheeler. Captain Haddock collides with the statue of Colonel Olcott outside Fort Railway Station. Head of statue breaks off and falls on the Captain’s backpack smashing several bottles of whiskey. Snowy licks up whiskey. Drunk Snowy staggers onto path of speeding bus. Tintin rescues Snowy. Tintin hits bus driver with a left hook. 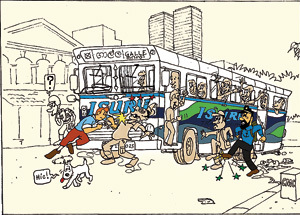 Captain Haddock kicks bus conductor but misses and stubs toe against footboard. Crowd cheers! The three-wheeler is stuck in traffic near the Liberty Cinema. Villains in a sinister-looking black Mercedes Benz approach.No number plates. Villains open fire with T1 assault rifle and chuck hand grenade. Tintin throws back grenade into Mercedes. Mercedes explodes. Locals rush to pick up bits of car as spares. Tintin & Captain then get on a crowded bus. They are standing. “Blistering barnacles! How many people can they pack into this thing?” says the Captain whilst removing someone else’s elbow from his mouth. 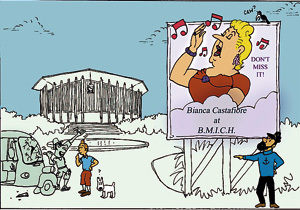 Massive cut-outs and walls covered with posters announce the Milanese Nightingale Bianca Castafiore’s concert at the BMICH. “That woman follows us to the ends of the earth!” says Haddock. At the Mount Lavinia Hotel Rastapopoulos is in the company of a local politician. Allan is there as well. “Great Snakes…etc”. Brief fight ensues. Politician’s men turn up and overpower Tintin and Haddock. Snowy bites politician’s behind. The scene now moves to Sigiriya. 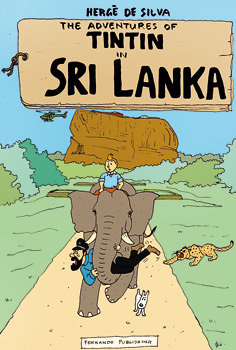 Tintin and Haddock are about to be pushed off the Sigiriya Rock by Rastapopoulos and his Sri Lankan partner in crime. Snowy deliberately upsets a hornet’s nest. The hornets sting the villains.This allows Tintin and Haddock to escape. They jump on a passing elephant. The villains are in hot pursuit on foot with hornets running in third place but Rastapopoulos slips on elephant dung and falls flat. Hornets sting Rastapop and his henchmen. Meanwhile, Thompson and Thomson are hot on Tintin’s trail but, as usual, in the wrong direction. They buy an old Morris car and end up in Hikkaduwa instead of Sigiriya, having read the road map upside down and with no knowledge of Sinhalese. They bump into General Alcazar who is in Hikkaduwa running a beach shack called the “Manioca Inn”. He has been ousted again by General Manioca…I mean General Tapioca.Alcazar speaks in a curious mix of Spanish, English and Sinhala: “Hola mis amigos! Como estas? Ayobowan! You like un Arrack eka and unos bites, neda?”etc. Piotr Skut, the Baltic pilot, is flying seaplanes for an air taxi company owned by a local politician. Chang is CEO of “Yeti Engineering, Shanghai” and has got the contract for a massive Chinese funded project at Hambantota. Thompson and Thomson go beachcombing. Thompson steps on a sea urchin (“Yeeeow!”) and Thomson ditto (“To be precise, Yeeeow!”). Cut to a different scene. It is Asgiriya and there is a cricket match between Sri Lanka and Syldavia. Tintin and the Captain are waiting in the stadium for Rastapopoulos and his partners in crime. Thompson and Thomson are disguised in a traditional Sri Lankan Mudliyar type dress: Sarong, coat, hair tied into a bun and complete with a curved comb (Nami Panawa). There we are! Just add more bits and the names of a few local thugs and criminals and we are in business. I will personally write to Paramount and Columbia Pictures but don’t let Steven hear about this! Steven Spielberg, that is. Like Steven Spielberg, I am happy to settle for 30% of the gross takings. Anybody who wants to become a Tintinologist should read “Tintin: The Complete Companion” by Michael Farr, which is still in print. Did Tintin ever visit Colombo? This is rather contentious. Wikipedia lists destinations visited by Tintin. There is an entry which says: “Colombo: The Blue Lotus (The SS Ranchi passed through it)”. This ship, the SS Ranchi, may have passed through Colombo, but there is no evidence that Tintin passed through Colombo. He was kidnapped off the ship the same night that the ship set sail from Shanghai on its way to Bombay. Following this incident Tintin is taken back to China by the kidnappers. However, at the end of this adventure, “The Blue Lotus”, Tintin sails back to Europe from Shanghai (on an un-named ship) and therefore should have passed through Colombo. A ship by the name of S.S Ranchi actually did exist and belonged to the Peninsular & Oriental Steam Navigation Company (P&O). She apparently sailed between England and the Far East.